در این پژوهش قارچ خوراکی دکمه‌ای به‌صورت کامل، با استفاده از خشک‌کن ترکیبی مایکروویو ـ جریان هوای گرم در دو حالت چگالی توان ثابت و متغیر با سطوح چگالی توان (1/5، 2 و 2/5 وات بر گرم) و 3 سطح دمای 23 (محیط)، 50 و 70 درجۀ سلسیوس برای جریان هوای گرم ورودی خشک شد.سپس راندمان خشک‌کردن و کیفیت نهایی محصول خشک‌شده (رنگ و ظرفیت بازجذبی) مورد ارزیابی قرار گرفت.بیشترین مقدار راندمان خشک‌‌کردن در حالت چگالی توان ثابت 1/5 با دمای 23 درجۀ سلسیوس، 44/44 درصد به‌دست آمد. نتایج ارزیابی پارامترهای رنگی نشان داد که محصول خشک‌شده در حالت چگالی توان ثابت کیفیت ظاهری (رنگ) بهتری نسبت به حالت متغیر داشت و افزایش سطوح چگالی توان و کاهش دما باعث کاهش کیفیت محصول از بابت رنگ شد. همچنین محصول خشک‌شده با چگالی توان ثابت در مقایسه با چگالی توان متغیر و استفاده از هوای گرم نسبت به هوای محیط باعث افزایش ظرفیت بازجذبی محصول شد. حاضر وظیفه، ا. 1391. طراحی، ساخت و ارزیابی خشک‌کن ترکیبی مایکروویو-هوای گرم. پایان‌نامۀ کارشناسی ارشد، دانشکده کشاورزی، دانشگاه ارومیه. خوش‌تقاضا، م.ه.، حسین‌زاده سامانی، ب.، فیاضی، ا. و امیرنجات، ح. 1395. پیش‌بینی محتوی رطوبت خشک‌شدن لایۀ نازک قارچ خوراکی به کمک شبکه‌‌های عصبی مصنوعی پس‌انتشار. فصلنامه علوم و صنایع غذایی، 13(50):171-182. شریفیان، ف. 1391. مدل‌سازی و بهینه‌سازی فرایند خشک‌کردن انجیر با استفاده از خشک‌کن مایکروویو. پایان‌نامۀ دکتری، دانشکده کشاورزی، دانشگاه ارومیه. محبی، ص. 1393. ارزیابی پارامترهای کیفی گوجه‌فرنگی در فرایند خشک‌کردن با روش‌های مختلف. پایان‌نامۀ کارشناسی ارشد، دانشکده کشاورزی، دانشگاه ارومیه. نوری، م.، کاشانی‌‌نژاد، م.، دارایی گرمه‌‌خانی، ا. و بلندی، م. 1391. بهینه‌سازی فرایند خشک‌کردن جعفری با استفاده از روش ترکیبی هوای داغ-مایکروویو. نشریه فرآوری و نگهداری مواد غذایی، 2(4):122-103. Abbasi Souraki, B., & Mowla, D. 2008. Experimental and theoretical investigation of drying behavior of garlic in an inert medium fluidized bed assisted by microwave. Journal of Food Engineering, 88(4):438-449. Alibas, I. 2007. Microwave, air and combined microwave-air drying parameters of pumpkin slices. LWT-Food Science and Technology, 40(80):1445-1451. Andres, A., Bilbao, C., & Fito, P. 2004. Drying kinetics of apple cylinders under combined hot air-microwave dehydration. Journal of Food Engineering, 63(1):71-78. AOAC. 1980. Official method of analysis. 13th ed. Association of Official Analytical Chemists, Washington DC. Argyropoulos, D., Heindl, A., & Muller, J. 2011. Assessment of convection, Hot-air combined with microwavevacuum and freeze-drying methods for mushrooms with regard to product quality. International Journal of Food Science and Technology, 46(2):333-342. Botha, G.E., Oliveira, J.C., & Ahrne, L. 2012. Microwave assisted air drying of osmotically treated pineapple with variable power programmes. Journal of Food Engineering, 108(2):304-311. Dondee, S., Meeso, N., Soponronnarit, S., & Siriamornpun, S. 2011. Reducing cracking and breakage of soybean grains under combined near-infrared radiation and fluidized-bed drying. Journal of Food Engineering, 104(1):6-13. Hazervazifeh, A., Moghaddam, P.A., & Nikbakht, A.M. 2016. Microwave dehydration of apple fruit: Investigation of drying efficiency and energy costs. Journal of Food Process Engineering, 40(3): e12463. Horuz, H., Bozkurt, H., Karataş, H., & Maskan, M. 2018. Simultaneous application of microwave energy and hot air to whole drying process of apple slices: drying kinetics, modeling, temperature profile and energy aspect. Heat and Mass Transfer, 54(2):425-436. Kisselmina, Y.K, Druon, C., Gnimpieba, E.Z., Delmotte, M., Duquenoy, A., & Laguerre, J.C. 2013. Power density control in microwave assisted air drying to improve quality of food. Journal of Food Engineering, 119(4):750-757. Kotwaliwale, N., Bakane, P., & Verma, A. 2007. Change in textural and optical properties of oyster mushroom during hot air drying. Journal of Food Engineering, 78(4):1207-1211. Li, Z., Raghavan, G.S.V., Wang, N., & Vigneault, C. 2011. Drying rate control in the middle stage of microwave drying. Journal of Food Engineering, 104(2):234-238. Rhim, J.W., & Lee, J.H. 2011. Drying kinetics of whole and sliced shiitake mushrooms (lentinus edodes). Food Science and Biotechnology, 20(2):419-427. 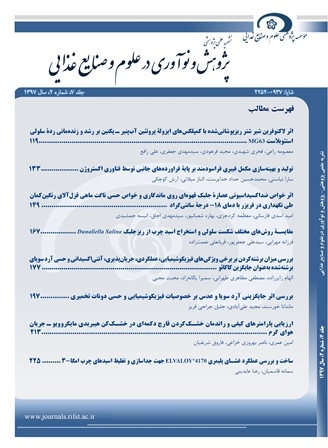 Sharifian, F., Modarres-Motlagh, A., Komarizade, M.H., & Nikbakht, A.M. 2013. Colour change analysis of fig fruit during microwave drying. International Journal of Food Engineering, 9(1):107-114. Sharma, G.P., & Prasad, S. 2006. Optimization of process parameters for microwave drying of garlic cloves. Journal of Food Engineering, 75(4):441-446. Torringa, E., Esveld, E., Scheewe, I., Berg, R.V.D., & Bartels, P. 2001. Osmotic dehydration as a pre-treatment before combined microwave-hot-air drying mushrooms. Journal of Food Engineering, 49(2-3):185-191. Zhang, M., Li, C.L., & Ding, X.L. 2005. Effects of heating conditions on the thermal denaturation of white mushroom suitable for dehydration. Drying Technology, 23(5):1119-1125. Zhenfeng, L., Raghavan, G.S.V., & Orsat, V. 2010. Temperature and power control in microwave drying. Journal of Food Engineering, 97(4):478-483.